Mile Hill Rd. 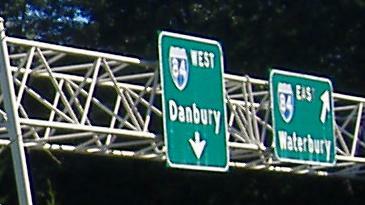 WB, the connector from CT 34 to the I-84 Exit 11 onramp, and then the onramp itself. 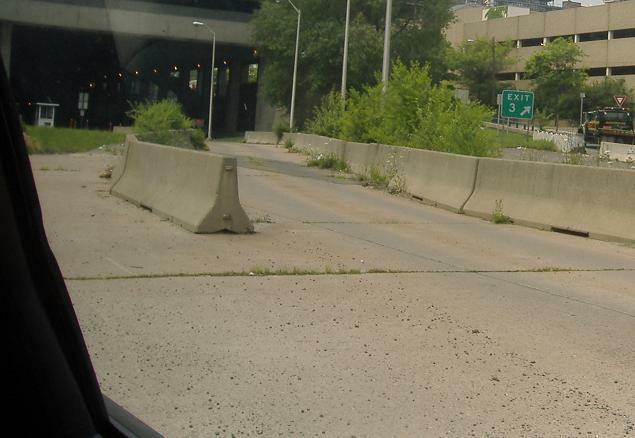 The Exit 11 ramps stub at Mile Hill Rd., but it has nothing to do with the CT 34 freeway stub in New Haven - this would have been the CT 25 freeway to Bridgeport. Looking north and south along Lake Zoar on the Housatonic River. 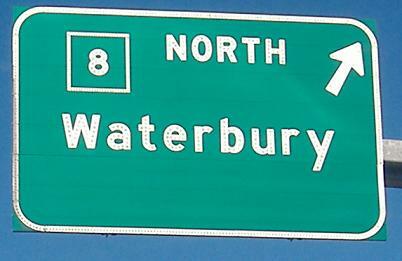 WB at and onto Bridge St. in Derby, across the Housatonic River. Looking southeast at the downstream railroad bridge, and CT 8 in the background. Eastbound into the sun in Derby. 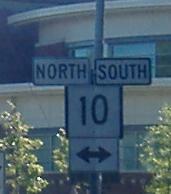 Westbound, same place. 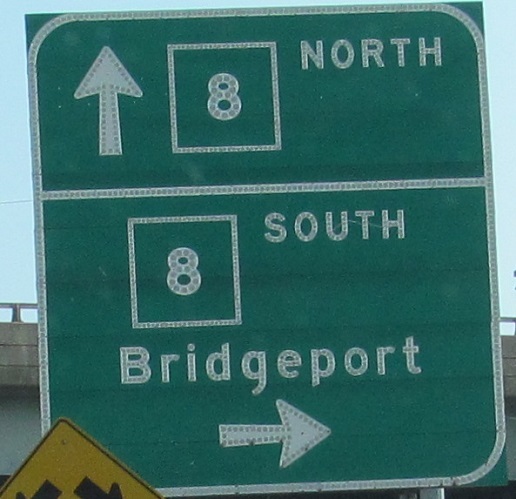 The arrows are an older style for ConnDOT; the newer style would put them at the bottoms of their signs. The next railroad bridge to the east is over the Naugatuck River, right before it meets the Housatonic. Same line as the last truss, looking south from CT 34. 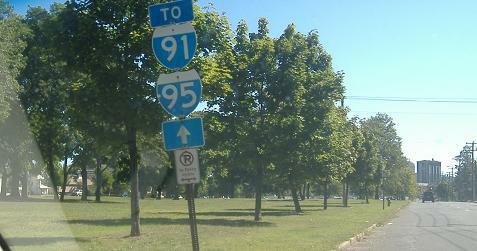 Eastbound at CT 10, where CT 34 turns right toward the alignment it would have been on had the freeway been fully built. Your second clue comes by looking left into a suspiciously long and narrow cleared park, between two roads named Frontage. 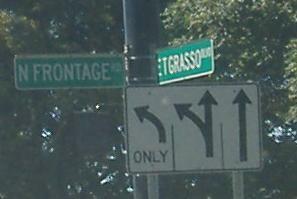 S. Frontage Road, aka CT 34 EB, heading into downtown where the freeway currently begins. It's not a given that it will remain forever stubbed, but its future looks bleak. 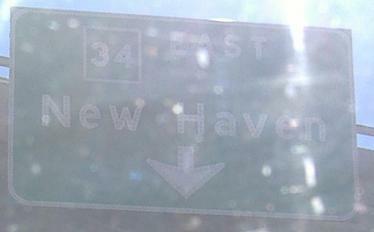 Courtesy Doug Kerr, somewhere in New Haven, close to the beginning of the CT 34 freeway. 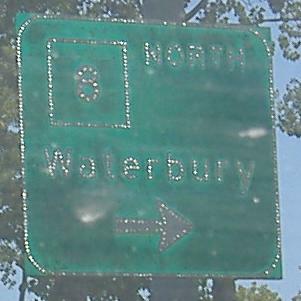 The eastbound beginning of the freeway. 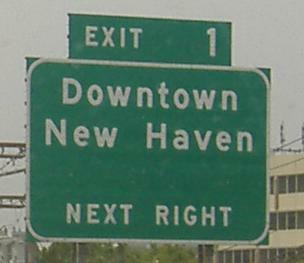 CT 34 was meant to extend as a freeway northwest from New Haven, but only a small part within the city limits was built. As you can see in the third photo, the western stub of the freeway ends up as a garage underneath a tall building. Had CT 34 been extended west, the freeway lanes would have run underneath the building and York St., which itself runs underneath the building. 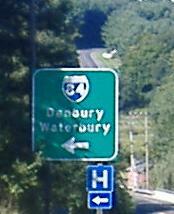 The merge in the second photo is where CT 34 traffic (and any other general traffic) enters the freeway. 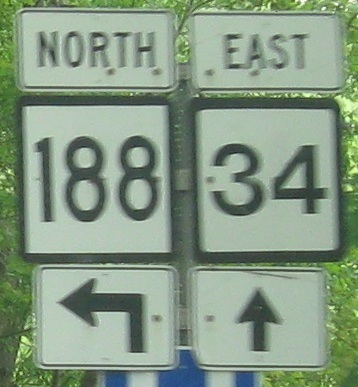 Sign bridge at the eastern end of CT 34. Westbound run along the freeway right back to the garage - as you can see, there are more westbound than eastbound exits, funnelling traffic to and from I-91 and I-95. 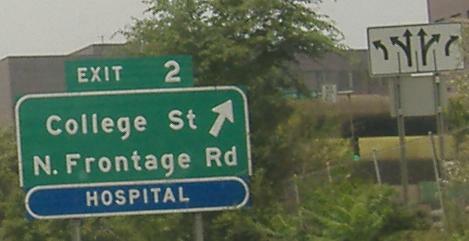 Orange St. NB entering CT 34 EB at Exit 1.